With the election of the Liberals does it mean there is no more RecFish SA? Not looking for a heated debate about what is happening, just a factual answer to my question. It would appear so from this press release? I am after confirmation that what recfish central is true and they are not jumping the gun. That "media release" is nothing more than some soap boxing from those within a forum admin group and a couple self proclaimed advisory groups. Until I see an official release from some one within the new government I wont believe a word from any of the people quoted in that badly structured and amateur onlne PDF. Only 3 members of the new government have been sworn in. The remainder get sworn in on Thursday. Pretty sure this wont be the #1 thing they do when they do. Election policy/promises one thing, legislation changes once in government are a very different animal. Its concerning your trying to make this out to be something that's its not, yet. By all means, try and hold them accountable to the promises they made to you, but honesty and transparency will go along way to gaining any credibility amongst us. LOL, Feel free to link on here any slandering I’ve done Graham… just pointing out facts that’s all. By the way, give a rats what you or any other facebook/forum admin think of me. Do you understand that a pre-election policy means nothing? This is just what they plan to do not what they have done. They still need to implement this and im not saying they wont but it wouldnt be the first government to back-flip on a pre-election promise. How about waiting to see what they actually do before getting too carried away. Thanks for putting that up Yelliwtail. It is good to see the truth being presented. According to the policy above, no, RecfishSA are to be part of the new body. 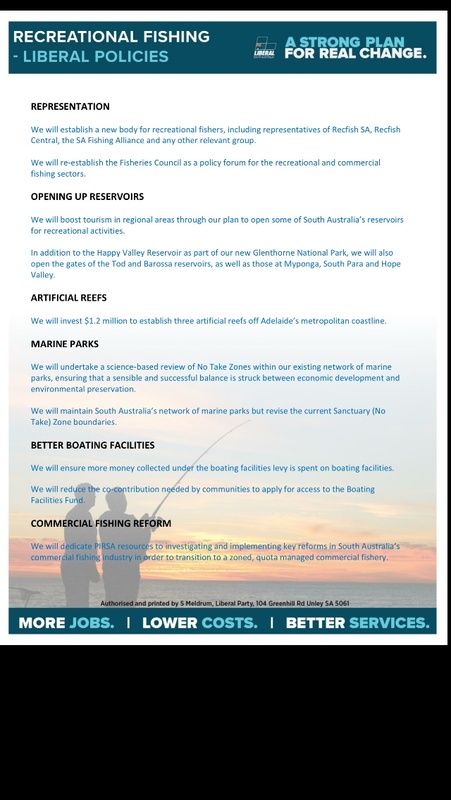 "We will establish a new body for recreational fishers, including representatives of Recfish SA, ...."
Just to make sure we're talking the truth not assumptions. Truth? All I'm seeing is a pre-election pamphlet knocked up by the Liberals outlining what they "promise" to do if elected!! Anybody who thinks that a government intends to or in fact can realistically deliver on all election promises is delusional. I, like the rest of this forum will wait and see if this re-structure actually happens, and if so, anything good comes of it. YELLIWTAIL see attached link. where does it state that recfish will be abolished in the first 100 days? stormboy, I hope I am not misunderstanding you. I do not believe that Yelliwtail would use the words "recfish will be abolished". From what I understand, RecFish SA are welcome to come and take a seat at the table. Will be interesting to see what happens and how effective this new council will be. Are they volunteered positions or is there funding attached? Would hate to see the same issues with the new group - i think we need to follow the victorian model and make some drastic changes, so we can once again have an outstanding fishery in the next 5 to 10 years. Also will be interesting to see if they allow the dredging of the channel as originally planned, given they seem to be pro business (relaxing trading hours, reducing business tax, etc). Again, this was PRE ELECTION. Again, (happy to be proven wrong) I can't see it anywhere being stated as being implemented within 100 days of taking office. Of note, I see PIRSA will be for the better word, the gate keeper's. Snapper15.4kg "abolished" was probably the wrong word to use sorry. I am a supporter of the idea but I just feel that atm everyone is getting ahead of themselves. the details are vague and no time frame has been put in place. I just feel as though all of this carry on is getting peoples hopes up. we need to take a step back and wait for something to happen before jumping the gun. We need to understand that this is a new gov and they have almost no experience in governing. Things will more than likely take longer than anticipated to happen because of this. I also feel that there are more urgent matters for this gov to deal with than this issue. Yup, first thing I noted when the policy was originally released. That, and bringing back the Fisheries Council of SA. No official communication from anybody with any clout. No changes in regards to anything. Tim Whetstone (no longer the pre-election David Ridgway) is now the go-to person. Tim Whetstone is a busy man. Tim Whetstone`s priority list of "things to do" may very well not have the implementation of a new RFC towards the top of the page. And, just maybe, Tim Whetstone is starting to realise what is involved in creating (essentially) a completely new representative body in terms of legislative, regulatory, administrative and departmental considerations, not to mention functionality handover including any ongoing projects and initiatives. If anything happens my guess is that it will take months, quite possibly into 2019. And a bag limit of one tuna seems to be more of a priority for the government at the moment...! I think all is not what was expected, the new Rec Fishing Rep needs to be approved by PIRSA to ensure they will just rubber stamp whatever PIRSA wants and the SBT issue will show the way the new government will handle rec fishing issues. I hope I'm wrong but at the moment it seems we have jumped from the fat into the fire, come on Tim, prove me wrong. An update arising from Tuesday night`s RFSA Forum, from Upper Spencer Gulf RFC Rep.
Yeah, RecfishSA had the discussion on licenses a couple of weeks ago on facebook and the outcome was that it was a good idea for freshwater but a bad idea for salt water as there is no intentions to stock salt water species, buy back used licenses (it's pointless to buy back latent licenses as they are not utilised), introduce TACCs or for PIRSA to do anything to change their established practice of continually taking from the recs to give to the pros (i.e. the SBT issue at the moment, KGW, Blue Swimmer Crabs). I think the SBT issue shows that we are likely to be worse off than we were before. No final decisions have been made on this issue so I live in hope that the government will stand up for the myriad of small businesses that benefit from rec fishing as opposed to a dozen or so tuna barons. I hope they prove me wrong and do the right thing by all South Australians and not just a few that donated $320K to their election campaign. When are all the bodies mentioned going to show where they get their funding from? Lots of rumours that could easily be squashed if this information is released. Lots of hiding going on at present. With the new government there has been no flagging to date of funding specifics for either the proposed Council, OR recreational fishing initiatives overall. The former not so much of an issue (assuming a pool of dedicated volunteer individuals), the latter gives some cause for concern. I can`t recall a dollar amount being mentioned pre/post election? Given all the information to date, one would be forgiven for thinking that the new Council representing the purported 277K will be comprised of circa 8 - 12 appointed and/or elected (somehow) individuals, primarily from 4 groups/organisations, meeting somewhere a few times a year, on their own time of course (albeit surely not at their own expense!? ), with who-knows-what funds to play with for the betterment of recreational fishing in SA. Indications that the Council will be reporting direct to the Ministers office is certainly an improvement (on paper anyway, it will be interesting to see how that works in practice as a counterpoint to any PIRSA-driven imperatives), but that aside I don`t see too much more worth celebrating for now. Still no comment from any group about where they have been getting funded from. Looks like the rumours are true. Lobbying for the pros, anyone? And lets not forget, a very prominent member of the government now owns one of, if not the, biggest pro fishing companies in the state. Guess we know where the funding was, and is, coming from! Hows this working out for you Mr Keegan? Supposedly 277,000 Anglers have an invested interest in this situation, you claim to represent how many of them? Whats the update from SAFA? Some might suggest such a release would probably not be the most politically savvy action at this juncture. Never mind. Where does a "South Australian Recreational Fishing Advisory Council" ring a bell from?